Get off my case, Mom, I'm improving my brain functions by playing this game. Neuroscientists at the University of Carolina recently finished the latest study in findings on multitasking through videogames. 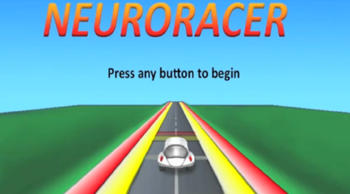 They reported that participants in the study who trained by playing Neuroracer, a videogame in which players drive and must identify road signs, performed better on memory and attention tests outside the game for six months. The researchers monitored the brain waves of participants and found the older adults who played Neuroracer had increases in theta brain waves, which are associated with attention. Comparatively, adults in their 20s regularly have bursts of theta. The study also found that multitasking skills decrease with age. People in their 20s experienced a 26 percent drop when driving and identifying signs in the game as opposed to simply driving, whereas the drop was 64 percent for people in their 60s to 80s. However, other neuroscientists cautioned that many games advertised as "brain games" do not work as advertised. A previous study showed heavy use of "certain off-the-shelf, intense shooting games" can improve the player's ability to ignore distractions. Daphne Bavelier, leader of that research, said, "We know we can rewire the brain, but the challenge is how to do it properly." Dr. Adam Gazzaley, leader of the team of neuroscientists at University of Carolina, said the transfer of benefits from inside the game to outside the game was "grabbing," but he also warned that the findings do not suggest that any activity or videogame improves cognition. "There's a big leap between what we did here and the real world," he said.